This crank-operated overhead passenger railway transports its passengers from one end to the other in two cars which travel in opposite directions. 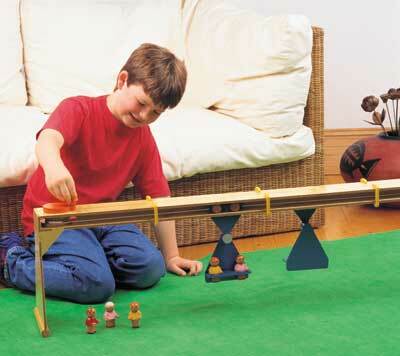 The rounded feet enable it to operate at almost any angle so it can be set up in all sorts of interesting situations. Other loads can be hooked or tied onto the holes in the car seats making it useful for transporting all sorts of cargo. 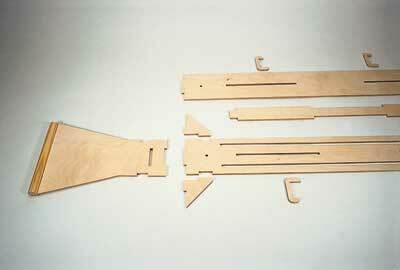 1 Cut out all the components, but see Step 2 below for some of the details on cutting out the top and bottom rail. Counterbore the 6mm (1/4in) holes in the pivot caps and drill the holes in the pivot spacers before you cut them out. To make the long cuts you will need to use a blade twisted through 90 degrees (see Cutting long pieces of wood, page 7). 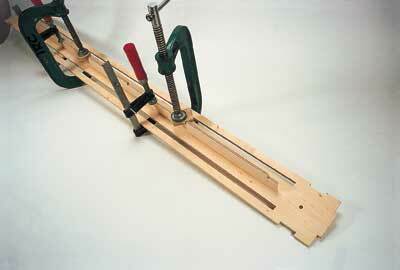 2 Join the top and bottom rail strips together with double-sided tape and fret out the centre slots. Cut out the notches on the ends and also drill the pulley holes. Separate the two strips and carefully mark them with a pencil for later reassembly. Fret out the other slots from the bottom rail and the notches in the sides as seen in Photo 1. 3 Check that the centre divider (Photo 2) fits the top and bottom rail and mark all three with a pencil for reassembly. 4 Trim the studs at the base of the pillars with a knife to a 6mm (1/4in) diameter section. Glue the two pillar feet onto the pillars as shown in Photo 3. 5 Glue together the pulley wheel components as shown in Photo 4. Note the round pulley has a 7mm diameter hole and the hexagonal pulley has a 6mm (1/2in) one. Counterbore the two 6mm (1/4in) holes into the crank, remembering that they enter from opposite sides. Check that the hexagonal pulley shaft fits into the central hole on the crank but do not glue it. 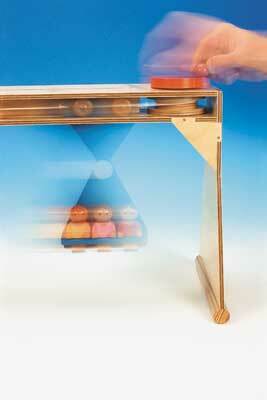 Drill a hole in to the 19mm (3/4in) wooden ball (see Drilling and cutting wooden balls, page 6). Glue the dowel crank handle into this hole (Photo 4) and into the second hole on the crank. 6 Glue the centre divider onto the bottom rail and make sure it is square. Clamp them together firmly until the glue is set (Photo 5). Reinforce the joints with 3mm (1/8in) dowels through the bottom rail and into the centre divider. Repeat the process with the top making sure that the pulley holes match. 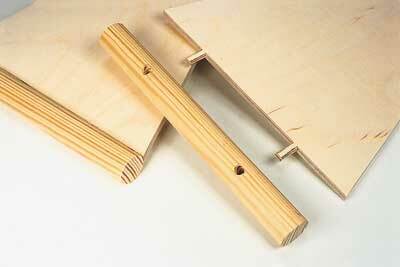 Glue on the pillars and the fillets and reinforce these joints with 3mm (1/8in) dowels (Photo 6). 7 Glue the car seats, pivot spacers and car pivots to the car arms (Photo 7). 8 Glue one 25mm (1in) wheel to one end of each of the four 3mm (1/8in) axles (Photo 7, top right). 9 Make the plastic washers. 10 Glue the arms and bodies together. You can sit the people in the holes in the seats to get the arms level. When the glue is set, trim the tops of the arms at the shoulders with a Gent's saw and finish off with a sanding block. Drill 6mm (1/4in) holes between the shoulders and into the 25mm (1in) wooden balls. Glue the 6mm (1/4in) neck joints into them. 11 Carefully rub candle wax onto all the moving parts, but avoid areas that are to be glued. Paint the crank, track supports, cars, car pivot caps, car bogies and people with oil-based enamels. Then varnish the areas that are not waxed and will not be glued. 12 Attach a washer with a 6mm (1/4in) hole to each side of the pulley wheel with the round inner section using double-sided tape. Place the pulley wheel in position at the end of the track with the 6mm (1/4in) hole and insert the 6mm (1/4in) pulley shaft. 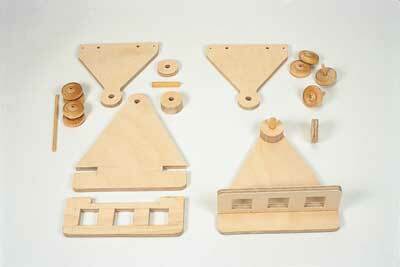 Check whether the pulley wheel rotates freely: if necessary, take it out sand down the plastic washers a little. 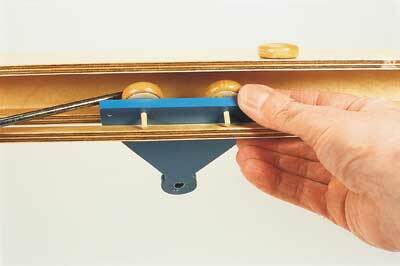 Glue the pulley shaft to the top and the bottom rail only. 13 Glue the hexagonal pulley shaft into the crank and place another washer on it. Tape a washer each side of the hexagonal pulley wheel as you did for the round one. Insert the pulley wheel between the top and the bottom rail, insert the pulley shaft into the 7mm (9/32in) hole until the crank is in position, and check that it runs freely. If not, sand the washers down a little. Place some glue in to the pulley's hole before reinserting it and then feed through the pulley shaft until the crank is in position. 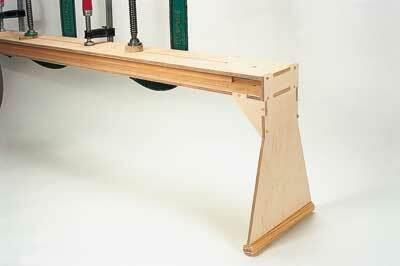 Do not glue the shaft to the top or bottom rail. 14 Thread a small-holed washer over each of the wheel axles. Insert the car bogies through the slot in the bottom rail (one either side of the centre rail) and push the wheel axles through the 3.5mm (1/8in) diameter holes from behind (Photo 8). To aid access, the track can be moved. Add rest of the washers and glue on the outer wheels. 15 Glue three track supports onto each side with epoxy resin. One goes exactly in the middle and the others 305mm (12in) in from each end. 16 Insert the car pivots through the holes in the car bogies. Glue the car pivot caps onto the pivots, making sure that you do not get any glue on the bogies, or the cars will not swing. 17 Fasten the car bogies in the centre of the track. Pass the end of a piece of 2mm (3/32in) nylon cord through a hole in the car bogey and make a knot. Pass it around the circular section pulley and tie it onto the car bogie on the other side by passing it through the 2mm (3/32in) hole so the knot is again at the back. Fit another cord to the other 2mm (3/32in) hole in the first car bogie and pass it twice around the hexagonal pulley before fastening it with moderate tension to the other bogey via its remaining 2mm (3/32in) hole. Check that everything runs smoothly and that cars both travel as far as they can in each direction. "The rounded feet enable it to operate at almost any angle so it can be set up in all sorts of interesting situations"
Pulley rims (2) - 6mm (1/4in) plywood - 80mm (3 1/8in) diameter with a 7mm (9/32in) diameter hole. 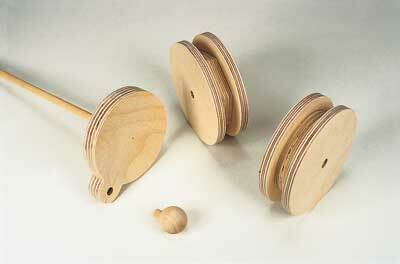 Pulley rims (2) - 6mm(1/4in) plywood - 80mm (3 1/8in) diameter with a 6mm (1/4in) diameter hole. Plastic washers (5) - 20mm (13/16in diameter with a 6mm (1/4in) diameter hole. Plastic washers (8) - 20mm (13/16in) diameter with a 3.5mm (1/8in) diameter hole.